I was born to wonderful Christian parents in the early 80’s, and my Mom actually led me in the “sinner’s prayer” when I was just three years old. I knew I needed to be saved, and asked Jesus to be my Savior, even though I didn’t fully understand the ramifications of that salvation. Throughout the next twelve years, I faithfully attended church and Christian school, but never really tried to live for God. Kind of hard when you get saved so young, you know? Well, when I was fifteen, the Holy Spirit made me aware of my need to start actively living for Him. And I cherish that day as much as the day I was born again into God’s family. Because that’s what it all became real to me. Shortly after refocusing my spiritual life, I felt God leading me to prepare for full-time ministry. In fact, I felt Him calling me to be a pastor’s wife… funny thing was, I had no desire to get married! Well, long story short, I went to college, studied Women’s Ministries, and met my husband while I was there. And then he enrolled in seminary, preparing to be a pastor someday. God really does work in mysterious ways! A few months after graduating from college, I started experiencing all sorts of physical problems. After many doctors visits, ineffective rounds of medication, and emergency trips to the ER, I was diagnosed with a rare disease, Wegener’s Granulomatosis. Wegener’s is treatable, but not curable, and I’ll be facing its effects for the rest of my life. Soon after my diagnosis, I started wondering how I was supposed to respond to everything: the sickness, the long-term effects, the change in my life’s direction. Being a reader, I started looking for books to help me through it all. But I didn’t find much that agreed with what I’d learned from God’s Word. So I decided to study the topic for myself… and this book, Touching the Hem, was born. I was born and raised in Massachusetts, and still cheer for the Patriots and the Red Sox. I lived in upstate South Carolina for a dozen years, and loved the close proximity to the Smoky Mountains. I’m currently sojourning in a small town in southwestern Wyoming, where my husband and I are helping with a small church plant. Someday my husband and I hope to plant a church in the area around northern Utah. We don’t have kids, but we do have a very cute, rather rambunctious shepherd-husky mix. My favorite books include Hinds’ Feet on High Places by Hannah Hurnard, Stepping Heavenward by Elizabeth Prentiss, A Place of Quiet Rest by Nancy Leigh DeMoss, and The Hobbit by J.R.R. Tolkien. My favorite books of the Bible are Psalms, Proverbs, and Romans. My favorite chapter is Psalm 103. 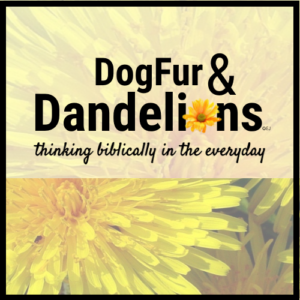 I also blog regularly at DogFur and Dandelions, encouraging Christ-centered living through devotionals, book reviews, and other real life stuff. I’d love to have you come visit me there! And now it’s your turn! Please take a moment to say hi, and share a few facts about yourself!